Standing poses will bring a strong and confident attitude that will emanate within you for your entire day. Inspired beauty with balance through harmonizing strength, flexibility, and stability bringing grace and confidence to each step of the rest of your day is the fruit that standing asanas bring into your life.. The warrior is disciplined, fearless, strong, and flexible. To stand firmly and breathe softly is the essence of this dance that moves through the practice of Virabhadrasana ll. Expanding within the framework of this strong asana keeps us steady amidst the chaos of the ups and downs of life. Strength building creates a powerful and sturdy foundation which is so important to balance the emphasis on Flexibility we all seek in doing Yoga. Virabhadrasana ll also develops flexibility as a prime component in moving into the balance of the right angle. Flexibility and strength together bring the perfect yin/yang balance. 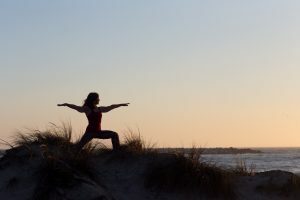 Virabhadrasana ll Inspires the attitude of quiet strength in the moment while being prepared for sudden change in the next. This is the essence of Virabhadrasana ll that I hope will add to your daily Asana fun of becoming strong and centered.